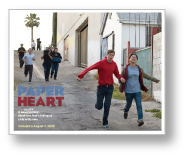 Paper Heart’s main theme is love or the notion of love. Charlyne Yi, (Knocked Up 2008) is a talented actress, writer, comedian and artist. At the beginning of this documentary, she proclaims that she doesn’t believe in love. She elaborates on this point, saying that she has never been in love and that her heart has never been broken so therefore; love doesn’t exist. Charlyne embarks on a journey throughout America interviewing people with her friend Nic (Jake Johnson) to find out about love first-hand. Through hearing couples stories about love she hopes to determine if, in fact, love does exist or if some people are destined to remain unloved. Along this journey, she meets Michael Cera (Juno 2007) who plays himself in this part documentary, part improvisational narrative film. What Charlyne doesn’t foresee are the romantic feelings she has for Michael and he for her. The story telling is fascinating and plays out as a charming film with added creative twists. Delightful puppets are used to tell the love stories of the couples that are interviewed. Charlyne actually designed most of the puppets herself. As Charlyne and Nic travel the country they meet a diverse group of people: young couples, couples that have been married 50 years, Elvis impersonators at Vegas wedding chapels, judges, novelists, bikers, children and science professors. These true documentary vignettes are enjoyable as they drive the story line. People talk freely about how they met their partner and tell stories that are usually funny or amazing about their journey. The colorful puppets and two-dimensional backdrops are used to illustrate some of the love stories and stories about courtship. I found these sequences most enjoyable and highly creative. The interview locations were somewhat unusual such as a biker bar in Oklahoma City where Charlyne interviews a large, burley guy who explains his idea of love to her. Later, she hops on the back of his cycle and goes for a cruise whilst viewers hear the vroom…vroom…in the distance. She interviews romance novelist, Sarah Baker, who explains the emotional bonding of a relationship. The conflicts and struggles are examined in relationships, but the personal sacrifice is the true sign that people are in love. While Charlyne is traveling around the country and discussing the film with Nic, she eventually does see Michael Cera at times in different situations. Nic probes and finds out that Charlyne isn’t sure how she feels about Michael although she does enjoy his company. Nic jumps to conclusions and hopes that she may be falling in love. He decides to find out and suggests that the couple film in Paris, as this will certainly bring the romance to a heightened level. The scenes with Charlyne and Michael are very sweet and natural. It’s hard to know when the acting starts and reality begins. An impromptu comical scene is when the duo decides to ‘ditch’ the camera crew and run like crazy. A poignant scene is the guitar playing and singing of the song, ‘You Smell Like Christmas.’ Neither has a particularly great voice, but that only adds to the realistic tone of the film. As Charlyne travels the country and explores the concept of love we begin to know her as a person and care about her. When it is clear that she does have feelings for Michael, the film becomes more curious and one does wonder what will happen. When Charlyne and Michael kiss for the first time, the camera pans around to reveal reaction shots from the crew, which is comical as well. A gem to be sure, the little Indie film, Paper Heart, can be enjoyed by all ages with a big message about love—and that’s for you to find out.